According the 1951 Refugee Convention, a refugee is someone who has been forced to flee his or her country because of a well-founded fear of persecution for reasons of race, religion, nationality, political opinion, or membership in a particular social group. The primary reasons refugees flee their countries are war and ethnic, tribal and religious violence. An unprecedented 65.3 million people around the world have been forced from home. Including in that number are approximately 21.3 million refugees, over half of whom are under the age of 18 and more than half of these refugees came from three countries - Syria, Somalia, and Afghanistan. The protection of refugees has many aspects. These include safety from being returned to danger, access to fair and efficient asylum procedures, and measures to ensure that their basic human rights are respected while they secure a longer-term solution. Forced migration requires multiple adaptations in short periods of time. People - especially but not only - children, become more vulnerable to abuse and neglect. Pre-existing social and mental health problems can be exacerbated. Importantly, the way people are received and how protection and assistance is provided may induce or aggravate problems, for example by undermining human dignity, discouraging mutual support and creating dependency. An acute sense of urgency among the people on the move may prompt them to take extreme medical and psychosocial risks and their fast-paced mobility through several countries, leaves only very little time for service provision. There is no single way or model to provide mental health and psychosocial support to refugees, but the Mental Health Psychosocial Support Network provides 12 good practice principles that have been agreed upon by organizations working in this field to guide the response and to prevent inadvertently doing harm. These principals include treating all people with dignity and respect; responding to people in distress in a humane and supportive way; prioritizing protection and psychosocial support for children, in particular children who are separated, unaccompanied and with special needs; and strengthening family support. 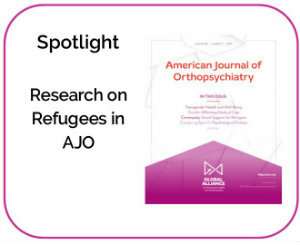 Our spotlight on AJO features research on refugees. Commentary from past president, Deborah Klein Walker and colleague on strengthening mental health supports for refugee children and youth. Learn more about the refugee crisis. 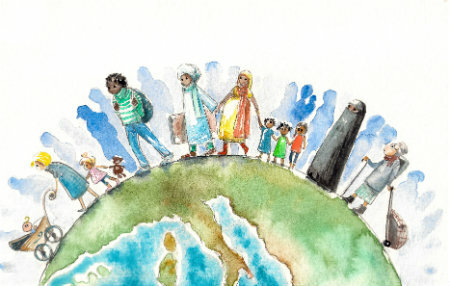 Visit the Welcoming Refugees website and learn how you can become a part of a growing movement of communities seeking to reduce barriers refugees face in their host countries. Support organizations that help refugees in your community, such as a local refugee resettlement center. Advocate for policies that will help prevent individuals and families from having to flee their countries and that will continue and expand humanitarian assistance.